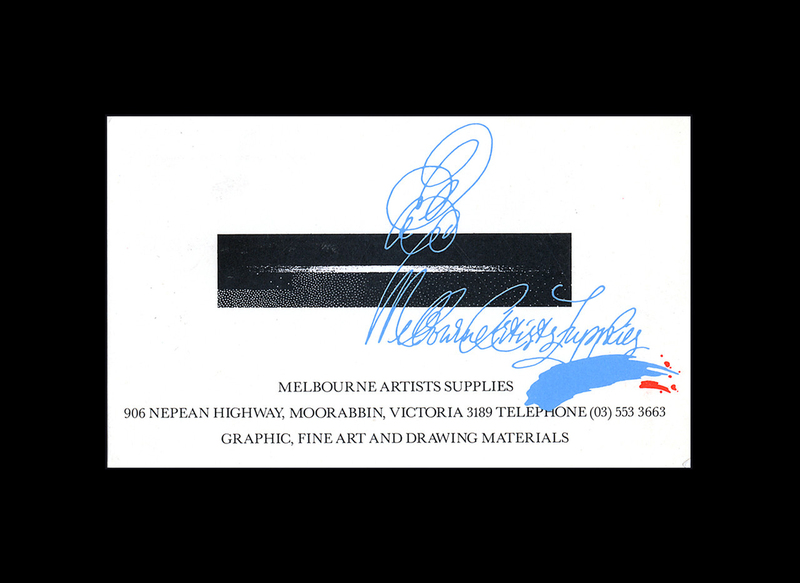 The business card above was designed by Bruce Weatherhead, a designer of exquisitely diverse talents who passed away in 2011. It was part of an identity program he designed in 1987 for an art supplier I frequented as a student. The central, dominant element, a thick black bar, has always intrigued and bewildered me. Still does. Over the top is an explosive calligraphic gesture, a motif commonly deployed by Weatherhead, his signature if you will. At its tail, overlaid with unbridled 1980’s flourish, is a brushstroke with a few blood red dots to finish. Contrasted against these expressive elements are three lines of text, typeset elegantly in Baskerville with an air of British sobriety. Juxtaposing such divergent elements was also characteristic of the great man’s technique. Seeing this card all those years ago was a revelation for me. For the first time I understood that design can sometimes be most effective by suggestion, rather than description.